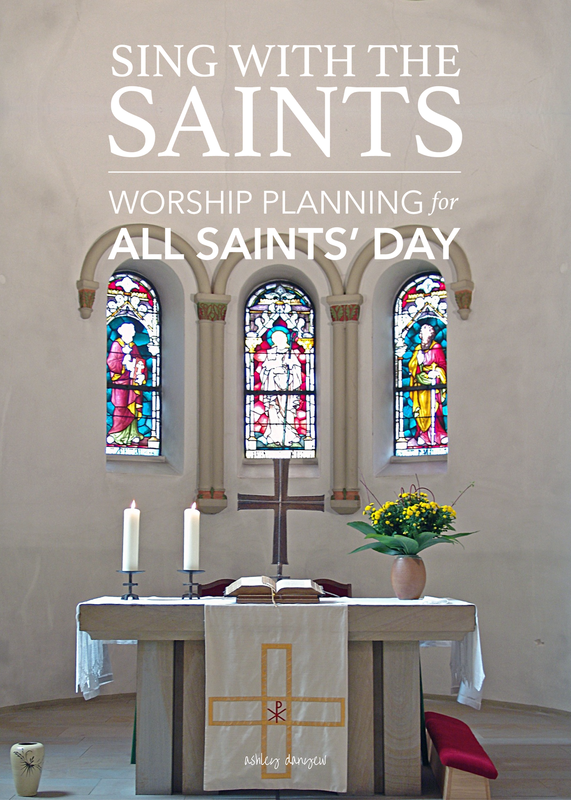 Here are a few resources and ideas that might be helpful to you in planning this year's All Saints' Sunday service. All Saints' Day is a day of remembrance and thanksgiving. Honor the saints in your community (those who've gone before and those still living) by planning thoughtful, meaningful moments in worship. Time of remembrance. All Saints' Sunday is a fitting day to those who have gone before us and honor the memory of those lost in the past year. Share a litany or prayer or moment of silence. Light a candle for each person. Read each name aloud and use handbells or chimes to toll for each person. Bell tree. This is a tangible way to honor and celebrate the saints in our lives (those who’ve gone before and those still among us). Pass out small bells when people arrive and have them write the name of someone who is or has been a saint to them. During one of the hymns, invite people to come forward and hang their bell on a "bell tree.” Carry the bell tree out during the last hymn and display it in the narthex after the service. Communion procession. We often sing a hymn right before Communion, but it seems fitting to me to do something a little different on All Saints' Sunday. Instead of having the elements set up on the Communion table before the service, perhaps the servers could carry in the elements during a special song or anthem. I think "Remember Me" by Mark Schultz would be a beautiful, meaningful way to honor the memory of those lost and prepare to receive Communion. For All Saints' Sunday, I usually lean toward anthems that focus on light, glory, peace, or faith. Hymn settings of "Holy, Holy, Holy" ("all the saints adore Thee") or "Shall We Gather At the River" ("gather with the saints at the river") are popular choices. Depending on the direction of your service, you could also do something more upbeat or Communion-related. A joyful, enthusiastic setting of this traditional Spiritual. An exquisite setting of a traditional American hymn, including rich harmonies, an a cappella section, and flowing accompaniment, gradually building to the final verse and coming to a quiet close. Tender and hopeful, this new setting of an old hymn text reflects the freedom and joy of heaven's celestial shore. A true American classic, this setting of "Shall We Gather At the River?" by Aaron Copland is not to be missed. A simple, singable anthem based on the Beatitudes with a recurring chorus that can be easily introduced to the congregation. The verses may be sung by the choir or soloists. A beautiful prayer of blessing for all of God's people, with text based on verses from Ephesians. A touching, inspiring anthem with comforting text from the perspective of the saints who have gone before us. It begins quietly and reflectively, gradually building to a triumphant end. Based on a traditional Scottish folk song, this reflective anthem features a simple, but supportive handbell accompaniment. An accessible anthem for choirs of all ages and sizes (children, youth, adult, or intergenerational) featuring traditional Latin text ("Pie Jesu Domine, Pie Jesu dona eis requiem"). A beautiful, accessible prayer of thanksgiving for and remembrance of those who've gone before us. A new setting of "Holy, Holy, Holy," featuring a Classical-style piano accompaniment and lyrical choral writing. Though definitely on the challenging side, this arrangement is such a classic setting of the Early American folk tune, HALLELUJA. Fun, rhythmic, and captivating. What are your favorite ways to celebrate All Saints' Day? What music will you choose for your service?